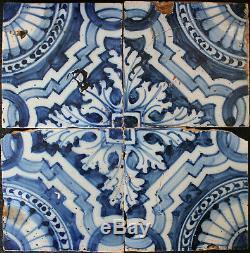 4 Portuguese Polychrome tiles made in the second half of the 17th century. Decorated with ferroneries pattern in blue and white. All four tiles have some chips to corners sides and surface of tile. More on this tile in J.
Dossantos Simoes, volume 1, page 57. Size of Portuguese tiles is 14 x 14 cm each (5.5 square each tile) Portuguese antique tiles in general are made primitively and therefore size, shape and thickness can vary a little. Backside of the tiles is cut as can be seen on the pictures; this is usually the case with 17th century Portuguese tiles. In antique tiles (Medieval, Portuguese, Spanish, Delft, Art Nouveau and Art Deco) and Dutch Delftware from 17th and 18th century. For TACS (Tiles & Architectural Ceramics Society) in England I organize the yearly tile fair in Nottingham. 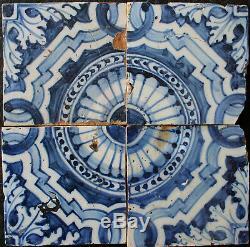 The item "4 Portuguese blue and white antique tiles from 17th Century ferronneries pattern" is in sale since Monday, October 29, 2018. This item is in the category "Antiques\Decorative Arts\Ceramics & Porcelain\Tiles". 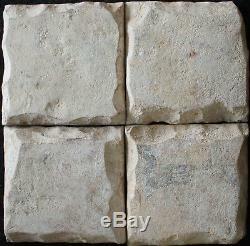 The seller is "markvanveenantiquetiles" and is located in Rossum GLD. This item can be shipped worldwide.